There's nothing like a group of pesky mosquitoes to spoil a nice family vacation. To combat this, it's important that you have a reliable bug repellent that you can count on to repel bugs when you are outdoors. Some natural repellents, such as lavender, witch hazel, eucalyptus oil, and cinnamon oil, can detract some bugs successfully. However, you won't find something as reliable as one of the bug sprays on our list. Bug repellent can be applied directly to the skin, clothing, or other surfaces that may be affected by insect bites. An insect repellent discourages insects from landing and attacking the surface area. Bug bites can be itchy, frustrating, and can cause infections. Most importantly, some bugs carry diseases and their bites can be potentially deadly. This is what makes a reliable insect repellent so important to have in your bathroom and travel bag. If you don't want mosquitoes, ticks, and other common insects ruining your next outdoor adventure, then protect yourself from bites by using a dependable bug repellent. You can enjoy the outdoors again by protecting your skin from sun damage, bug bites, and other external damage. Just make sure to apply sunscreen and then apply insect repellent on top, every time you are outdoors. As Amazon’s #1 best seller in camping insect repellents, the Repel Lemon Eucalyptus Natural Insect Repellent is the best non-chemical, DEET-free bug repellent on the market. It kills and prevents mosquitoes, deer ticks, sand flies, midges, stable flies, and other biting insects. It is highly effective, long-lasting, and will protect you against ticks for eight hours and mosquitoes for seven hours. It can even repel mosquitoes that can potentially be carrying the West Nile Virus for up to six hours. It can hold up in tough environments, but needs to be used twice daily for the best results. The new convenient spray makes it even easier to apply to your skin, face, and clothing. It does not leave any greasy or sticky residue behind after it dries, and it won't stain your clothing or damage your plastics or synthetics. While it is safe and natural, it still is not suitable for babies or toddlers under three years old. It does have a strong scent, so if you don’t like the smell of lemon and eucalyptus, this may not be the one for you. Time Magazine found that this bug spray has the recommended ingredients that the Environmental Working Group (EWG) deems safe and effective. The main ingredient, oil of lemon eucalyptus, is approved by the Centers for Disease Control and Prevention (CDC), the Environmental Protection Agency, and the Canadian public health authorities. Professional studies have shown that Repel is the only natural repellent that can compete with chemical insect repellents. Consumer Reports named this the best natural insect repellent and WebMD, Parents.com, and various online magazines also recommend this effective repellent. As Amazon’s #1 new release in pest control sprayers, Eco Defense Bug Spray All Natural Mosquito Repellent offers maximum protection for hours, even in the worst conditions. Most natural mosquito and bug repellents simply don't work as well as the versions containing chemicals. However, this bug spray is backed by outstanding reviews online and a 100% money back guarantee, so you can feel confident that it really will repel bugs and mosquitoes away from you. It will effectively stop mosquitoes, ticks, chiggers, no-see-ums, fire ants, flies, and gnats in their tracks. It has a proprietary blend of 100% all natural ingredients, including Geraniol, and has no harmful ingredients, fumes, toxins, or DEET. It is safe for the entire family to use on your skin and clothes. The Avon SKIN-SO-SOFT Bug Guard PLUS Insect Repellent Moisturizing Lotion SPF 30 is highly effective against mosquitoes, deer ticks, black flies, gnats, no-see-ums, and biting midges. It also has SPF 30 sunscreen protection, so it can serve as your sunscreen and bug repellent in one. In fact, the non-greasy sunscreen lotion will even moisturize your skin in the process with aloe and vitamin E. It also has a Gentle Breeze scent, so it won’t leave behind any chemical smells. The waterproof lotion is DEET-free and PABA-free. Time Magazine found that this bug spray has the recommended ingredients that the Environmental Working Group (EWG) deems safe and effective. It is hypoallergenic, dermatologist tested, and suitable for the entire family, so even your children can use it. It is moisturizing, can protect your skin from the sun, and will prevent bug bites, making it an incredible value and perfect for your travel bag. 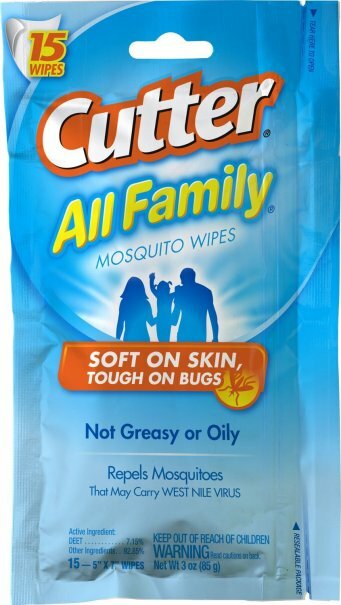 The affordable Cutter All Family 15 Count Insect Repellent Mosquito Wipes can repel mosquitoes that may carry West Nile Virus. Mosquitoes tend to be the main problem during outdoor adventures, so these wipes are meant to mainly target mosquitoes, but also offer soothing protection from ticks, biting flies, and gnats for up to two hours. The convenient wipes just need to be wiped on your face, neck, and skin for instant protection. They are safe for the entire family, so even children ages two months and older can use them. They are soft on your skin, won’t leave behind a greasy or oily residue, and have a cooling clean scent. There are 15 wipes in the pack and because they are in a resealable Ziploc pouch, they won’t dry out for a long time, and are really convenient to toss in your purse or travel bag. Time Magazine found that Cutter sprays and wipes have the recommended ingredients that the Environmental Working Group (EWG) deems safe and effective. WebMD and Consumer Reports also recommend Cutter repellents. Cutter has been offering all different types of repellentsfor every pest you can think of, for more than 50 years. So if these wipes aren’t right for you, check out the other effective, affordable options in the line. The 3M Ultrathon Insect Repellent Lotion formula was developed for and used by the U.S. Military. And if it’s good enough for the military, it should be good enough for your travel bag. This is a very small container of lotion, so it isn’t the most cost-effective option, but it is worth the extra money. 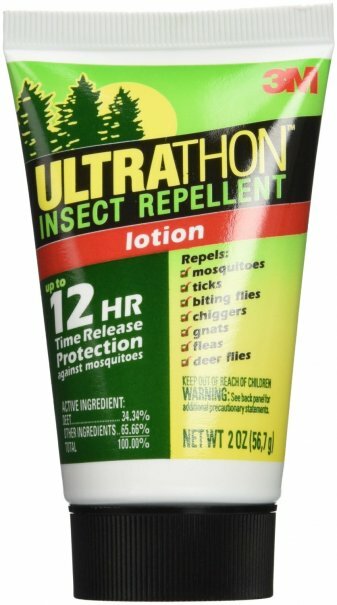 If you are planning an activity in a densely wooded, wet, or tropical area, then you need 3M Ultrathon Insect Repellent Lotion. You will be at a greater risk for insect-related illnesses like malaria, Lyme disease, or West Nile virus, and this lotion can help reduce your risk. The water and sweat-resistant lotion can repel mosquitoes, deer ticks, biting flies, chiggers, gnats, fleas, and deer flies. Thanks to its time-release technology, the lotion gradually releases the 34% DEET for up to 12 hours of protection, so it will last through all your outdoor activities. However, the strong DEET formula makes it unsuitable for kids, who shouldn’t have more than 30% DEET. It is easy to apply and absorbs quickly into the skin. It can leave behind a greasy feel, but it does not contain alcohol, so it won’t irritate your skin. Consumer Reports named this the best insect repellent thanks to the slow-release DEET formula. Experts, doctors, and WebMD also recommended this effective repellent and refer to it as the longest-lasting insect repellent. It is also consistently rated the best repellent by independent testing labs. It has overwhelmingly positive reviews online and is backed by a five-year guarantee. And those are our recommendations for the best bug repellents. As always, be sure to check Wise Bread's Buying Calendar to learn when and how to buy just about anything!